This week was actually looking up: all the crossovers were in a lull; there were some great original stories out from up-and-comers; “Invincible” was there to punch me in the heart; and—what is this? Superman was getting a shot of adrenaline, “Adventures of Superman” was written by guest writer Max Landis. Holy crap, I love Max Landis! The first thing I tell strangers is that one time I sat next to a rather inebriated Max at Comic-Con. “Chronicle” is one of the first movies to take super powers seriously and let’s not forget that “Death and Return of Superman” was the most incredible video on Youtube. So I cracked that book open with glee and devoured every single page. And then I closed the book and groaned because I did not want to have to write a bad review of one of my heroes. Now the issue isn’t all bad—it puts Superman in his proper costume with the red underwear and all. But that’s about it. 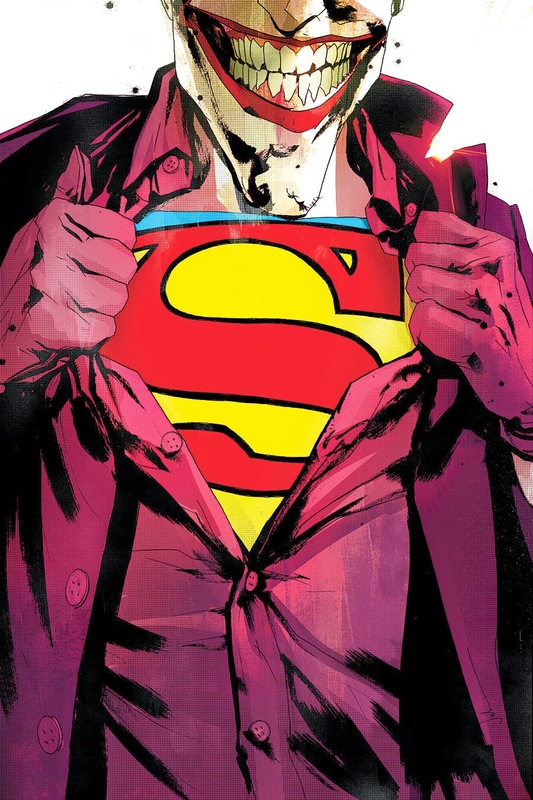 The story starts with Joker standing on the top of The Daily Planet with his finger on the trigger to some bombs and he wants to talk to Superman. Not a bad start, I mean the Clown Prince has done this kind of thing many times before so a few points off for originality but don’t change what isn’t broken right? But then Superman arrives and asks what The Joker wants—or more precisely, what are his demands? The Joker looks thoughtful for a moment before saying he hasn’t got any demands, his only demand being to see Superman has been met… Okay, I suppose that’s still Joker. I mean he does like to jerk people around so maybe there’s a point to this. Then Joker goes on a diatribe about how Superman is a crummy super hero because he’s vague. He makes decent points, after all Superman is the most generic of the super heroes, a case could be made that—Hey! I know what this is Max. This isn’t a comic story, this is “Drunk Comic Book History”. For those of you who don’t know, Max Landis’s early Youtube videos have some real great bits where he gets a little tipsy and recites the history of certain events in comic book history. They’re amazing and show a deep understanding of the medium that some creators today lack. That being said, why the F#@$ is this a Superman story? 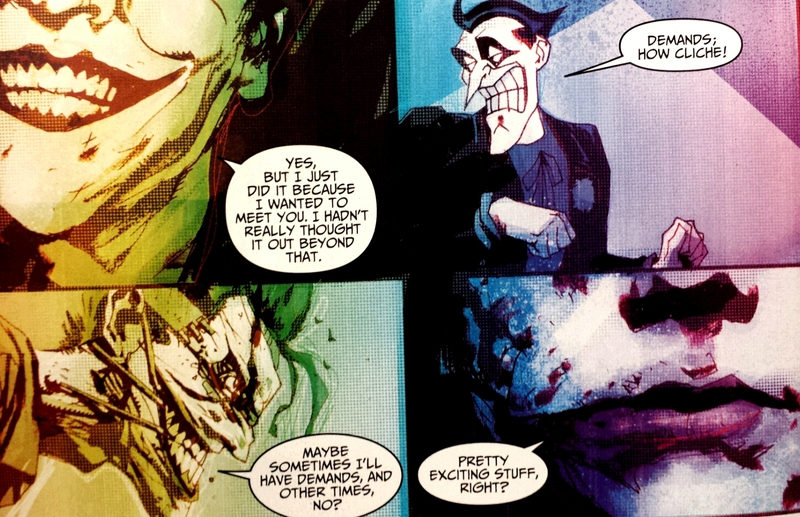 For real, Joker and Superman go back and forth telling each other what’s wrong with the other. Max… I didn’t buy an issue of Superman to get a lecture, I bought it because you are incredible at plot. There was a previous short Max Landis did at the back end of another issue of “Adventures of Superman” that explains the origin of Atomic Skull. It was five pages long, it had no dialogue, and it was incredible—one of the most compelling origin stories I had ever read. Which is why I was so excited for this issue to come out. 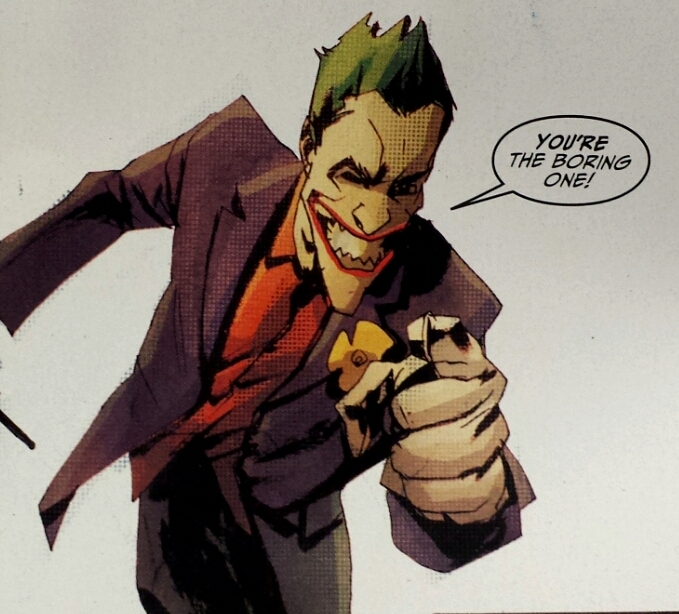 Instead I get to read about how Superman thinks Joker is a pop culture fake who really isn’t all that great. Hey Clark! Glass houses, buddy! The worst part is that Joker is defeated by having his feathers ruffled. That’s it. Don’t get me wrong, there’s a part where Superman laughs at Joker’s jokes and I thought that was an incredible turn for each of the characters. But then Superman puts down the Joker with verbal abuse. I would understand if he just spanked the Joker with his super powers, but Batman has been verbally sparing with the Joker since his inception. I suppose sixty years against the Dark Knight will really wear you down right? The sad part of the issue is that it’s a two-parter. Max wrote the first story and Fabian Nicieza wrote the second and it’s a great little story about Clark and has none of the pretentious air of the previous story. I suppose it’s a bit naïve of me to expect Max to do everything perfectly; but there was just so much going for this issue. Most of his previous work was golden, it was a meeting between Joker and Superman, and Jock was drawing with his beautiful yet grungy art. There’s ways to tell a confrontation like this as well. When Dinosaurus causes the world to flood, Mark confronts him. He doesn’t bother with an epic throw down. Instead he talks him through it. Dinosaurus flooded the world because the overpopulation and pollution was killing the planet. Mark points out that because of the dwindling resources; humanity was just starting to learn their lessons. However, with the decrease in humans contributing to pollution, humanity would have no reason to mend its ways; Dinosaurus caused more damage to his cause than humanity ever did. If Max was determined to pit the brain of Superman against the madness of the Joker, he didn’t have to do it by calling me a wanker for liking Joker. Sorry Max, this wasn’t your best work; “Adventures of Superman” #14 is 68% Invincible. PACIFIC RIM FANS!! Guillermo del Toro has some good news for you!